Madrid was our fly in fly out city. We only spent our first day and night & last day and night here. One thing became super clear to us as soon as we touched down- Christmas is a HUGE deal here. 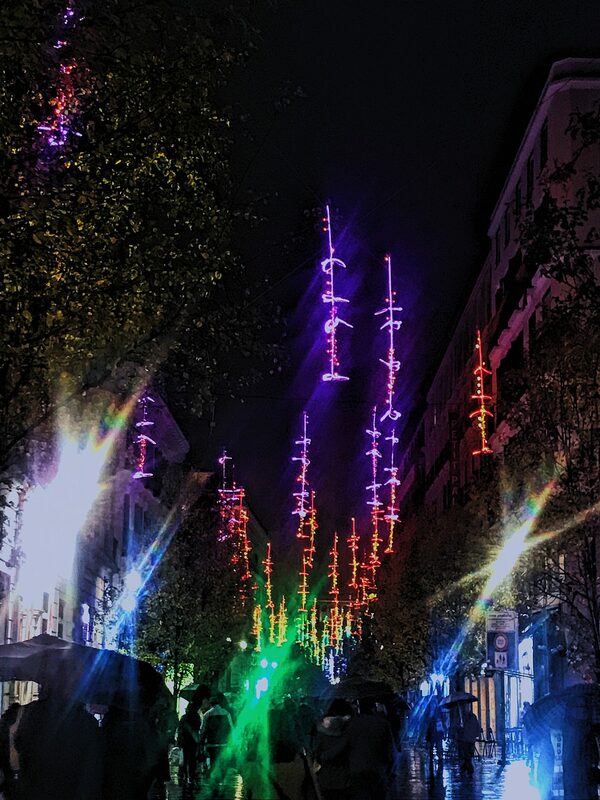 We felt that way about Spain in general but I would say the decorations in Madrid were the most over powering of all the places we visited. 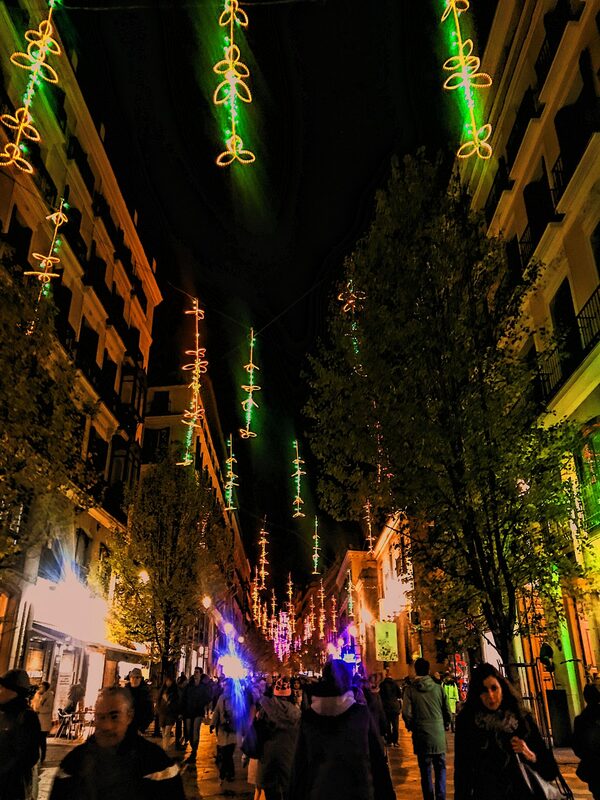 Every street branching out from Puerta del Sol (Madrid’s big public square, seemingly the heartbeat of the city) seems to have its own theme, with lights hanging high overhead as you walk down them. We arrived in the city early morning prettyyyyy jet lagged after having missed an entire night’s sleep to fly in. After getting our bearings and getting into a taxi, we arrived at our first hotel, Hotel Meninas. The location of this place was completely perfect. Just a short walk to where all the action was. I should let you know now that when my cousin and I travel together, we walk. A LOT. We both feel its the best way to get a feel for the area and most of the time don’t really have any specific plans so we just stop when we see something that looks cool or delicious or unique or anything really! Our room was SO cute! 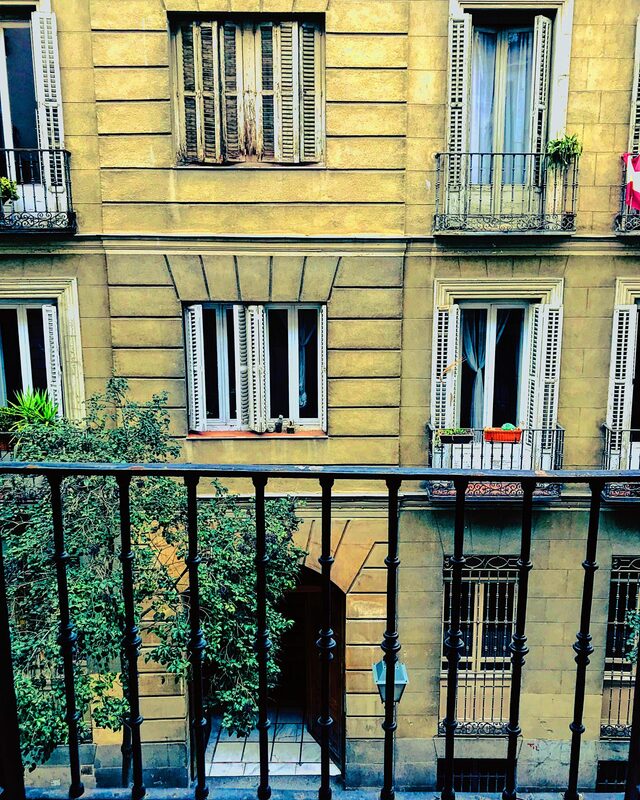 We realized we had not one or two terrace balconies in our room, but THREE. They were such great spots to people watch in the semi-busy street below. Three terraces and zero wigs on the floor. Back to Madrid. After being super touristy and standing on separate terraces and taking pictures of each other, we were ready to explore! After siesta-ing at the hotel for a couple hours, we headed back out. This time the city was transformed into what resembled a Christmas wonderland. The lights added an actual spark to the city. The center of the square housed a giant LED Christmas tree and it was PACKED on a Tuesday night. Not just with tourists, but locals also. 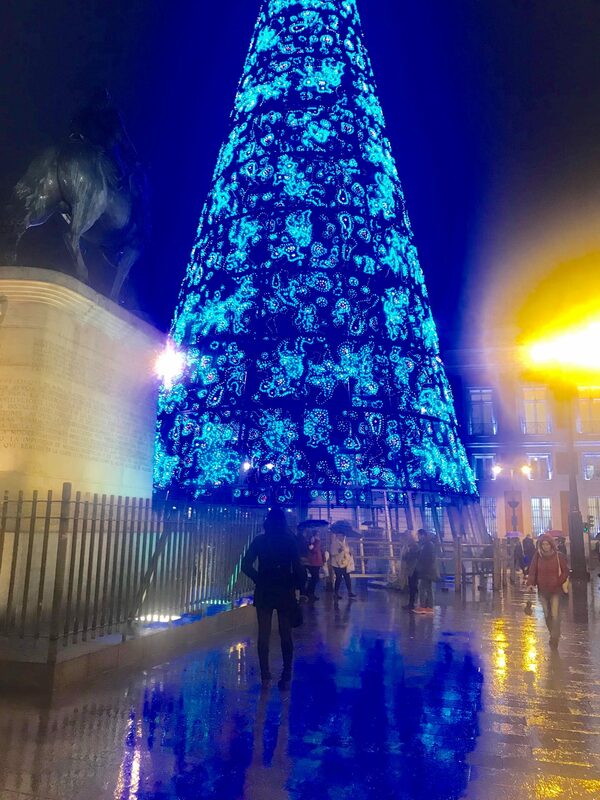 This is essentially the Rockefeller Christmas tree of Madrid. Even in the rain it was beautiful. Admittedly, I am not a huge Christmas person for my own reasons. However, this did really put some of the giddy childhood excitement into me. It was magical! That’s me! Doing something Christmas-sy! After walking around a ton we grabbed a late dinner and headed back to the hotel for our morning train ride to Barcelona! 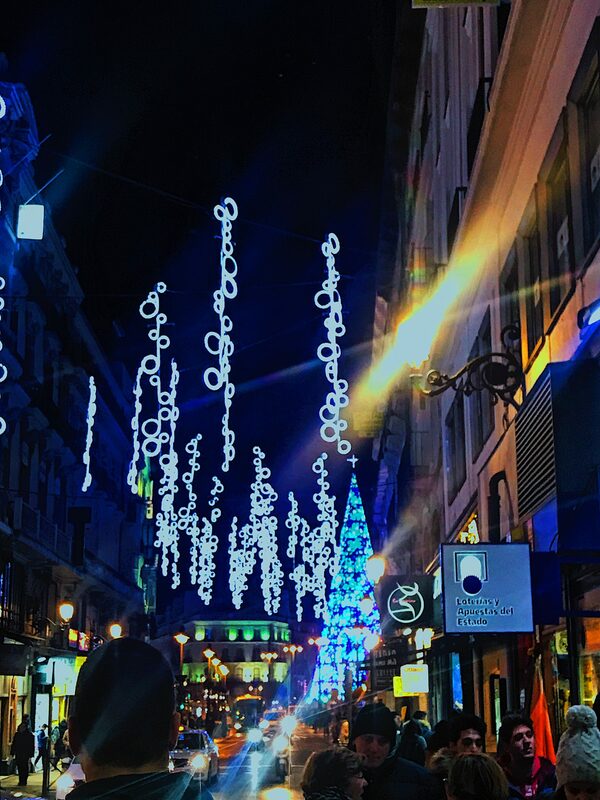 The lights look great…..and walking aimlessly is the best way to see the large European cities because you stumble across some many hidden treasures. From some experience the more lost the better! You go down some narrow alley way and just when you think you’re hopelessly lost opens open to an incredible public square. The triple balcony was amazing. So were the lights, and no wigs on the floor. Though at least this time, we would have expected it. You truly do experience Europe the best when you wander aimlessly. Because sometimes, the most authentic experience isn’t some huge landmark, but walking into a little out of the way cafe or restaurant where a local band is playing, or finding a beautiful little church that isn’t on the radar, where the choir is holding their weekly practice, and you can just sit there and listen to them (it probably goes without saying this has happened to me – the walking in, not the choir… nobody wants that!). 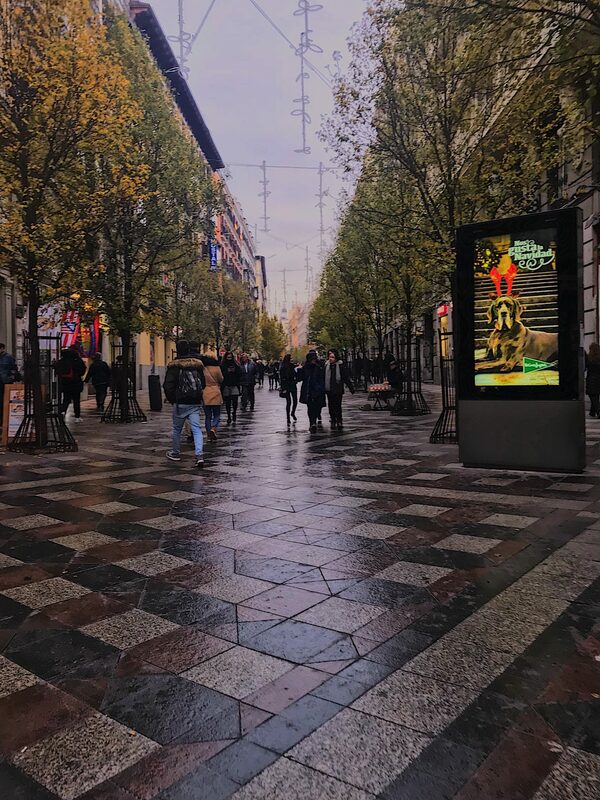 You make Spain sound as exciting as it really is – even amidst all the rain. 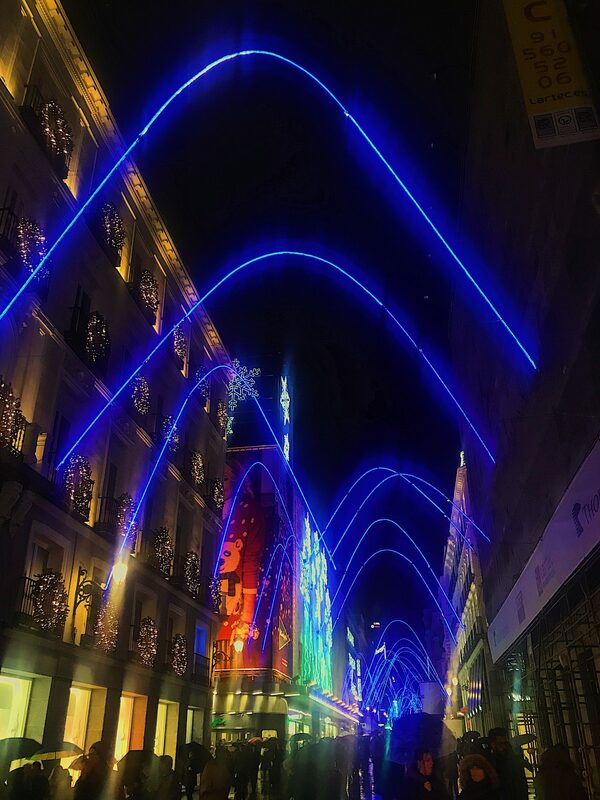 I had no idea that Christmas was such a huge deal in Spain, though I guess being a Catholic country that should not much of a surprise. 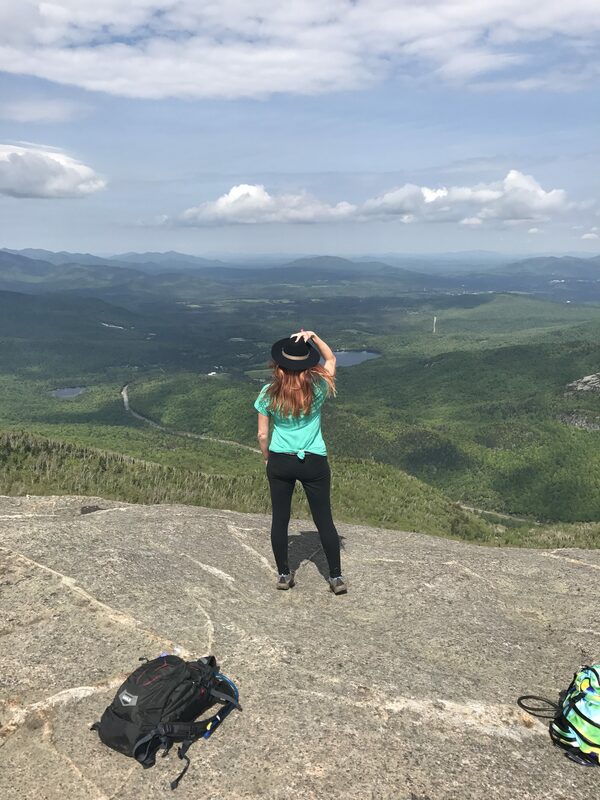 I agree that for travelers who need an excuse to take a break siestas are a great idea. The only down side is that trying to find a place to eat during siesta time can be pretty tough.